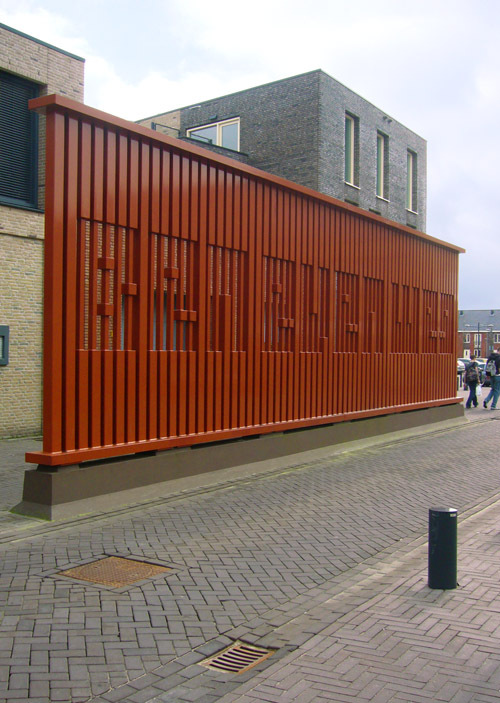 The artwork 'Ben Even Weg' by Martijn Sandberg is a free standing iron wall 4.5 metres high and 14.5 metres long, with the artwork 'Hallo, Is Daar Iemand?' *), located in the district of Floriande in Hoofddorp/ NL. While passing the artwork, a series of letters appears and disappears in the alternating of the railings of the fence over its full length. As if someone has just left a memo, a memento for ever in the trellis: 'Ben even weg' ('Back soon').